Cover: Esquire play fast and loose in the art department with a cheeky line drawing based on the Prestige original. I think the hat was ill-advised. RVG original US metalwork, no obvious indication of originating pressing plant. 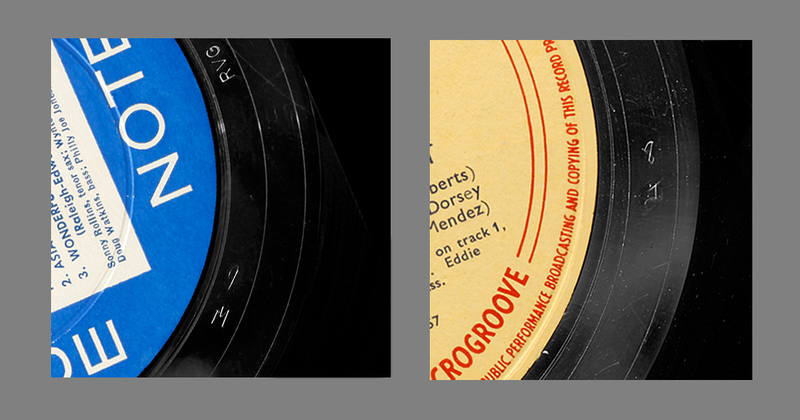 No-one appears to know the meaning of the “9M” engraving that appears on many early Plastylite Blue Note pressings, around 1957-8, not even the Fred Cohen, author of the collectors bible, Blue Note Guide to First Pressings. My working hypothesis has been the M referred to a mother lacquer and the 9 indicated a clock position for aligning the metalwork in a press. No other variant has ever been seen, only ever 9M. That is, until now. 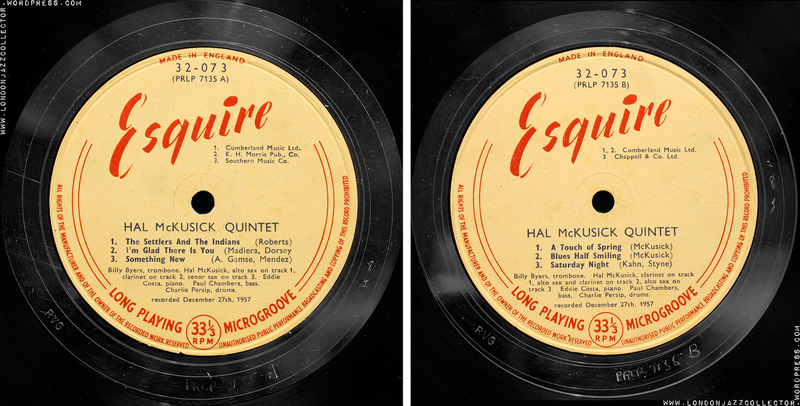 The Prestige metalwork for this Hal McCusick recording has a “8J” etched in the run-out. So that’s my theory blown straight out of the water. Any other explanation welcome, as I sure don’t have one. Not that it matters, but sometimes these thing are nice to know. Collectors Corner: What’s in a name? It’s a Schmidt! This brings to around a half-dozen or more of my records that bear the great collectors mark. Dealers have told me the Schmidt collection was well-known in the business, circulating first in the 1990’s. It takes a certain amount of courage or arrogance to write your name on all your record covers. In the Fifties and Sixties it was prudent to write your name on the cover, if you took records to parties and ever wanted to see them again. Even then, there was a casualty rate. I used to write my own name on the inner sleeves, for the same reason. Schmidt’s motives are less clear, as I suspect he was a more modern collector. His taste was impeccable, that is for sure. I wonder how many of us have a Schmidt on the record shelf, and how far around the world his records have flown. It is rise and decay: for many years records flowed from many collectors into one collection, then they flow out to many other collections, the undocumented migration of vinyl. 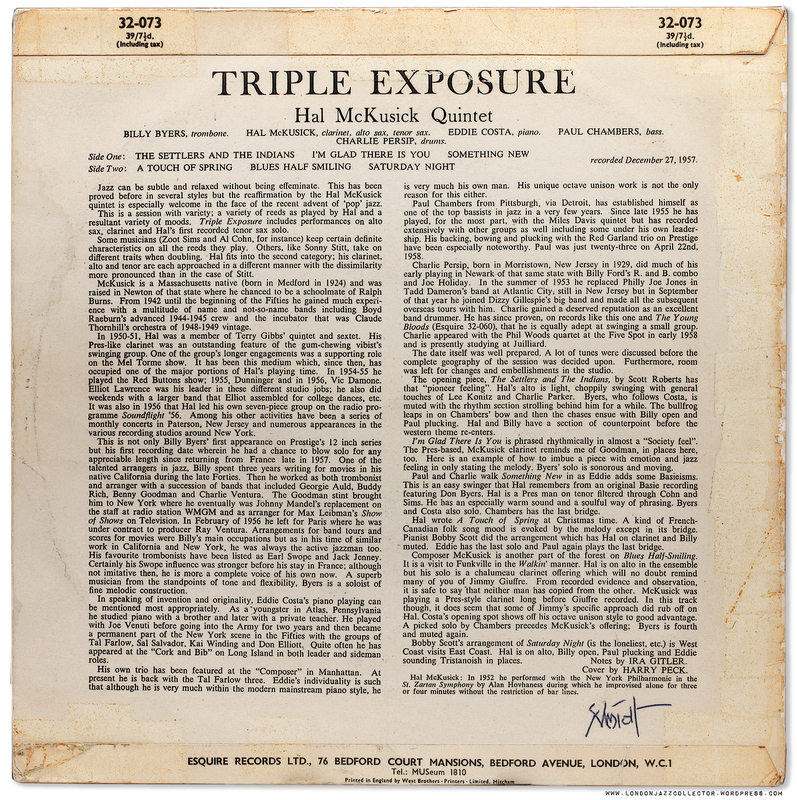 This entry was posted in Esquire, Hal McCusick and tagged 9M, Billy Byers, Charlie Persip, Eddie Costa, Esquire, Hal McKusick, Paul Chambers by LondonJazzCollector. Bookmark the permalink. He was a record dealer who used to have a record stall at Wimbledon Jazz fair many years ago. I have bought many records from him. All have his name on them. He had a great collection which he built up then sold on. Digging around in a shelf that is behind a pile of records tonight in my far too stuffed office/listening room, I found a copy of this, Work time and a Bags Groove with trident labels, which has created the evenings listen. All a delight so far, with the Bags Groove known like the back of my hand but the other two might be first listens. I like this clarinet playing on the McKusick more than Most’s, the nearest equivalent in 50’s modern jazz. Just to confirm, mine has the same 8J, but that would have been almost inevitable, as one run of the presses would have probably satisfied the 1957 jazz market in the Uk for such an unknown. Nice record – did not know this one. 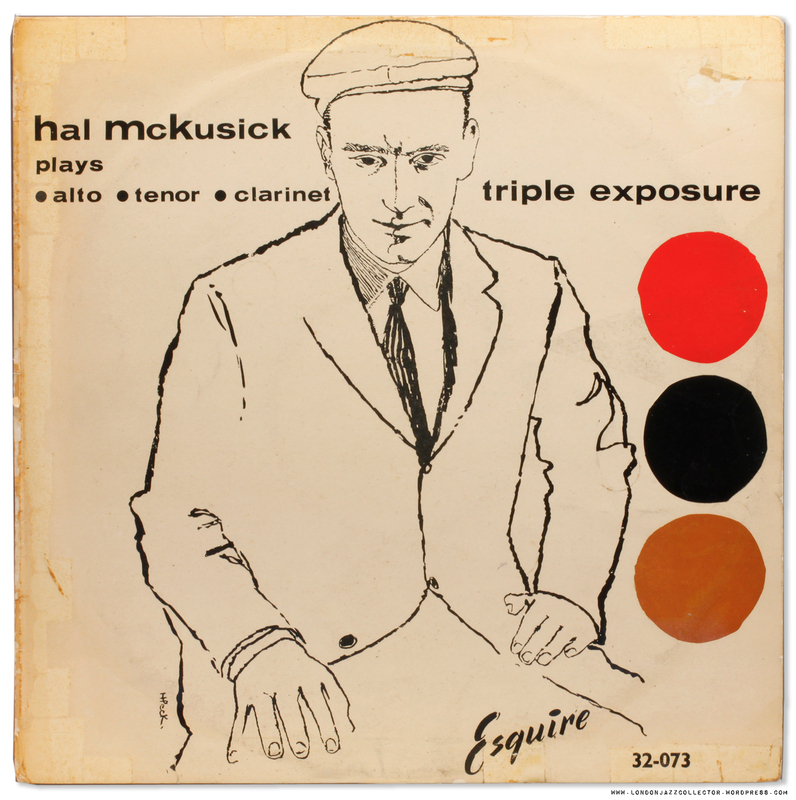 Interesting stuff – don’t know much about Hal McCusick at all but I like his laid back loping style here – a little Sonny Clark-ish I think. Don’t seem to have this particular 9 m marking on any of my few Esquires but there are some strange rune-like etchings on the runout in my Bags Groove Prestige Bergenfield fireworks label pressing: an arrow and an odd little ‘figure’ with a cross and legs. I have no idea whatsoever about those – bizarre. Can’t seem to pick the Esquires up on ebay – too expensive – but luckily my local record store – a Northern Soul specialist flogs them for about £20 when he gets them in. Congratulations to LJC for this nice find. 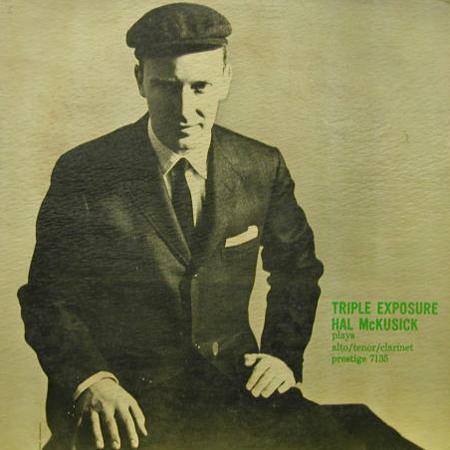 It has been a one off for Bob Weinstock to record McKusick who had already made a few succesful recordings for Coral and Bethlehem. I have never seen him as Desmond inspired. Paul Desmond, of course, was a class in its own, no followers. Hal appears to me to be of the Trumbauer-school, but was very much his own man. Paul Chambers and Charlie Persip, in these surroundings, do some wonderful things And dig Eddie Costa. The 9M enigma: your hypothesis could be right, who knows? I was never sure whether we need to read 9M or 6W. But the 8J gives a clue to that. I have several discards of Bob Blumenthal–I always check the names written on jackets, hoping to find some interesting association. I love that you have multiple records from Schmidt–I am sure I don’t have any. Quite a handsomely written name I must say! Who was this fellow, Schmidt?